Can Niacinamide and Vitamin C Be Used Together? It’s time for some myth busting, this time about confusing claims online about two of our favorite skincare ingredients: niacinamide and vitamin C. Several blogs, and even some beauty magazine articles, state that while the two ingredients are great on their own, combining them creates a two-fold problem: One, it neutralizes the effectiveness of both ingredients, and two, it might create a substance (nicotinic acid) that leads to skin redness. Sigh of relief: Research has shown that combining niacinamide and vitamin C does not lead to skin problems; in fact, the combination can lead to a wealth of skin benefits. What’s propelling the idea that niacinamide and vitamin C can’t be combined is old research that was interpreted incorrectly. 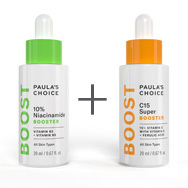 At Paula’s Choice Skincare, all our products and advice are research-based. We examine all research with a critical eye to see how it applies to the information we share and the ingredients we use in our skincare products. Here’s where we’re going to get science-y, but hang in there, your skin will love the results! The studies showing incompatibility between niacinamide and vitamin C date back to the early 1960s (yes, that far). These studies were off from the start because they used non-stabilized forms of both ingredients, whereas both ingredients are typically stabilized when used in modern-day cosmetics formulas. Niacinamide is a pretty “tough” ingredient; light and air don’t have the same effect on it as they do on antioxidants like vitamin C. What’s important for niacinamide is that the product be formulated at a pH that’s close to neutral. Vitamin C (pure ascorbic acid), on the other hand, does best in a low-pH (acidic) environment. However, nicotinic acid—the undesirable by-product of niacinamide and vitamin C—becomes an issue only when the niacinamide and vitamin C are combined in a high-temperature environment for a long time. That temperature is higher than you’d find in most at-home scenarios, including leaving a box of skincare products sitting outside in the sun for a couple of days. Also, it’s important to point out that this concern applies only to pure vitamin C, not to its many other forms (such as magnesium ascorbyl phosphate, tetrahexyldecyl ascorbate, and ascorbyl glucoside). So, to reiterate, combining ascorbic or l-ascorbic acid with niacinamide is fine. In short, any studies that show a definite issue from combining niacinamide and vitamin C were conducted in an environment that does not reflect what average skincare products experience during development, manufacturing, or in real-world storage and usage. This means that you’re safe to use both niacinamide and vitamin C, either together in the same product, or combined from different products that you layer one over the other. The benefits from such a mix are numerous: On its own, niacinamide is a skin-restoring ingredient that can visibly improve the appearance of enlarged pores, fine lines, and dull skin. Vitamin C is a potent antioxidant that defends skin against environmental assault, as well as a brightening agent that can improve the visible signs of aging. Together, these ingredients form a powerhouse combo that addresses uneven skin tone, wrinkles, loss of firmness, and dullness. All skin types will see a complexion that progressively becomes more radiant, smoother, more even, and noticeably younger-looking. One more point: We know, from reams of research, how niacinamide benefits skin. But did you know that vitamin C (ascorbic acid) is the most abundant antioxidant that occurs naturally in skin? It’s true! Given this fact, if vitamin C and niacinamide weren’t compatible, topical use of niacinamide would either do nothing or result in skin problems—today’s studies are showing only benefits. We invite you to try this combination for yourself. You might find you’ll become a true believer—no myths, just facts and results.